In honour of World Environment Day this note examines what may be considered a Viking Age example of recycling in Britain – the re-use of earlier monuments for burial. In true recycling style, this re-use of landscape features by the immigrants often involved adapting the monument to a new purpose. The Viking Age has numerous examples of Scandinavians recycling, including material from other cultures such as silver, weapons and, perhaps most revealingly, metal-work taken from religious items and turned into jewellery. However, another example of recycling had the ability, in rare instances, to transform the immediate environment: the re-use of monuments for Viking burial. Once thought to be an example of expediency, or indeed laziness, most Scandinavian scholars now propose that in Viking Age Scandinavia earlier monuments were deliberately chosen as they were potent echoes of past power. Appropriating them for new burials was a way of associating the family of the dead with past rulers of the land, thereby legitimizing the current claimants by emphasizing a sense of continuation. 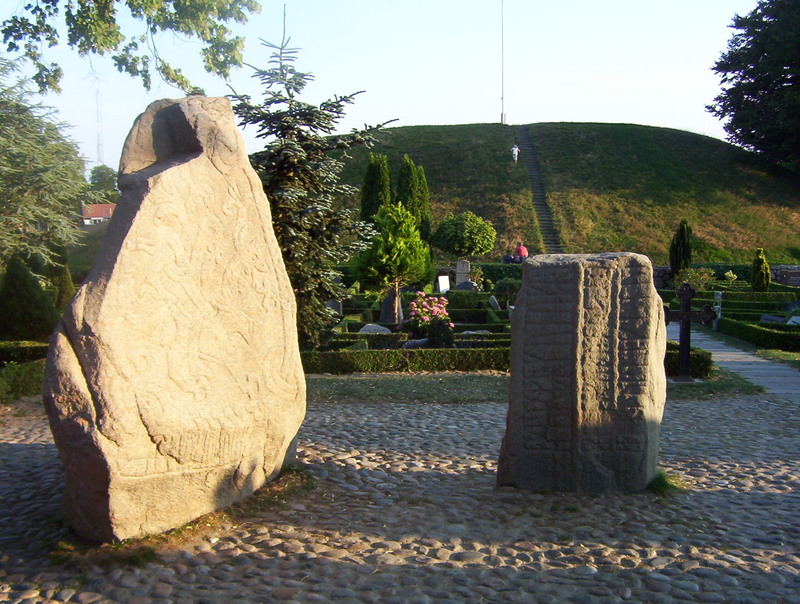 Perhaps the most famous example, and the one which most altered the landscape, is the Jelling complex created by King Gorm and his son Harald Bluetooth, in which two large burial mounds (one an enlarged Bronze Age mound), two rune stones, and a church superseded a large ship setting. Re-use of earlier monuments by Scandinavians for burials also occurred when they settled in Britain (primarily in England and Scotland) despite the impossibility, or at least extreme unlikelihood, of being able to claim kinship with those who had built the original monument. There are examples of earlier settlement sites re-used for burial, such as brochs at Castletown (north Scottish mainland) and Gurness, and even an abandoned Norse house at Buckquoy (both Orkney); as well as a cairn at Skeabost (Isle of Skye). However, the most common example of Viking Age re-use in Britain is in earlier burial mounds/barrows, effectively adding the dead of the new conquerors/settlers to the burial places of those who had previously ruled the land. Examples include the re-use of Bronze Age burial mounds at Housegord (Shetland), Aspatria (Cumbria), and Claughton Hall (Lancashire), whilst a Neolithic long-barrow was re-used for two burials at Rampside (Lancashire: it is not known if the church site is older than the Viking burial). The dates of these monuments clearly demonstrate that many of them were extremely old features in the landscape by the Viking Age, and it may be that the immigrants were seeking parallels to the ancient monuments that they were familiar with in Scandinavia. As Britain was Christian by the time of the Viking Age (there are many examples of Scandinavian burials in Christian cemeteries) it is uncertain what the relationship of the local populations was to these ancient burial places. It could even be questioned how bothered they would have been that the new Viking elite were being buried in mounds that had not been used for burial for millennia. However, work by Sarah Semple on the Anglo-Saxon material has demonstrated that in many instances such places remained important in the local psyche, sometimes as part of local folklore, but often as places related to elite, even royal, power. Consequently, the local importance of Viking burial in these ancient monuments should not be underestimated. The most radical re-fashioning of the environment by Vikings for burial in Britain occurred at Repton. Although some burials took place in the churchyard excavations in the 1980s, there was an uncovering of a mass burial near the church of at least 264 individuals who were placed in a large mound created by cutting down a building. The two-room building had been cut down almost to ground level and the de-fleshed bones were placed in one of the rooms and then covered with a cairn, which in turn was covered by a mound of pebbles and edged by kerb-stones. There was also a pit at the edge of the mound containing four juvenile skeletons, possibly sacrificed to commemorate the closing of the mound. The recycling of a building to create a large burial mound (approximately 14 x 11 metres) would have had a large visual impact on the surrounding environment, especially the potentially dazzling effect of the pebbles used to seal the mound. It is also likely to have had an emotional impact upon the local population who would be reminded of the events that had taken place at the site every time they saw the mound. In all of these examples, the recycling of ancient non-Scandinavian monuments for Scandinavian burial was a way for incoming elite to appropriate prominent places in the landscape to demonstrate their power and control of the surrounding land. The action would have changed the way in which people interacted with the sites, as whatever associations had existed were now replaced by that of a burial place for the migrant elite. Image taken by the author.